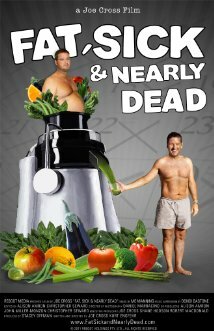 Fat, Sick and Nearly Dead follows the journey of a man, Joe Cross, who has a goal of reaching a healthy weight, ditching all of the medications he is on for high blood pressure and a rare debilitating autoimmune disease called chronic urticaria. He intends to accomplish this by consuming nothing but organic, raw juices he juices himself. Raw food is defined as food that has not been heated above 112 degrees Fahrenheit (a temperature that certain experts claim is the point at which healthy food enzymes die). I found myself immersed in this documentary because I, too, have a chronic autoimmune disease. What a dream if would be to reach for the stars following this man’s philosophy! He did it; why couldn’t I? However, not all autoimmune diseases are created equally. Because mine is a digestive and gastrointestinal in nature, juicing turned out to be something my body could not withstand, I was unable to complete my mission. The science behind this method is rather solid. It’s also rather common sense. It incorporates walking as start off exercise and as you gain strength, you’ll want to do more simply because you can. This will hold true with any diet plan that feeds your body what it needs in the healthy proportions it needs it. The 5 days I was able to follow the plan, I felt better. I had more energy and my steroid weight began to melt at a quick pace. What separates this documentary from the hundreds like it, is that it was clear to me early on that Joe Cross was not out to make a million dollars- he already had it many times over. He was interested in making himself well because he truly was fat, sick and nearly dead. Joe discovers along the way, that his story not only inspires others, but seeing him go through the paces sets a fire under even those who are not overweight and simply feel bad for various reasons. I think Joe surprised himself. I think he had no idea what he had started. And what he has done since, is proof that he was never out to do anything more than help himself and others navigate our world of fast food, titanic proportions, astronomical medical bills and cut the cost of human life.